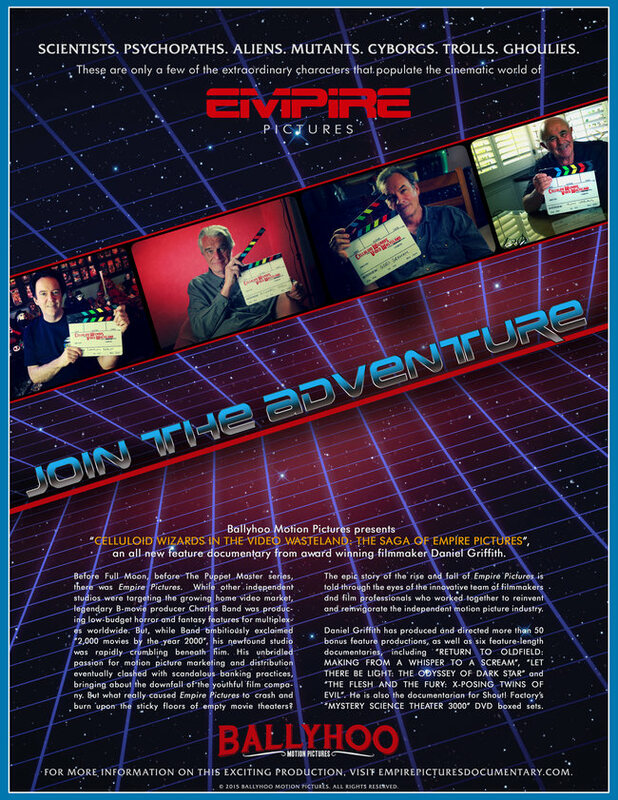 Schlock-Wire: Daniel Griffith Is Making An Epic EMPIRE PICTURES Documentary And You Can Help Fund It – Schlockmania! 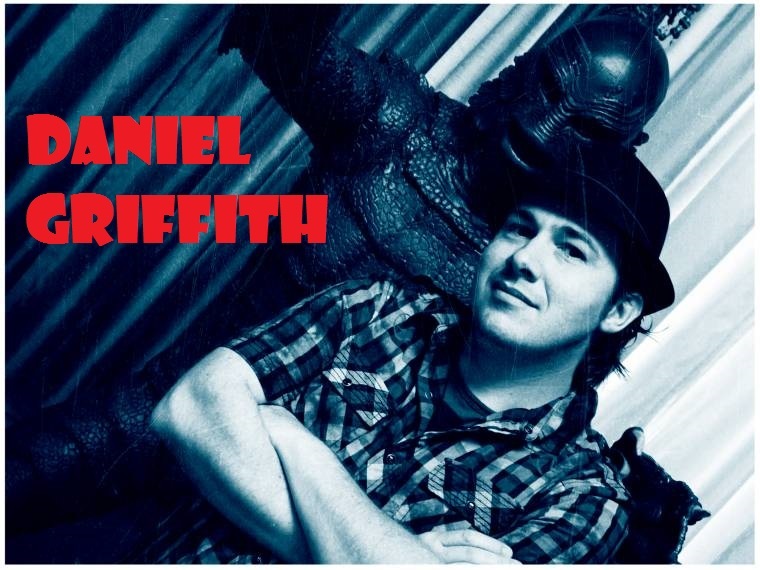 My name is Daniel Griffith. I am the owner and operator of Ballyhoo Motion Pictures. Over the past eight years, I have produced and directed more than 50 bonus feature productions, including material released by Universal Pictures, Legendary Films, Synapse Films, and more! I am also the documentary producer for the Mystery Science Theater 3000 DVD sets, released by Shout! Factory. My recent projects include an 70 minute documentary on the legacy of “The Twilight Zone” television series, and a feature-length documentary on the making of “From A Whisper to A Scream”, featuring Vincent Price in one of his final horror film appearances. As of this morning (October 14th), I am launching a monstrous Kickstarter Campaign to complete the official feature documentary about the rise and fall of Empire Pictures. 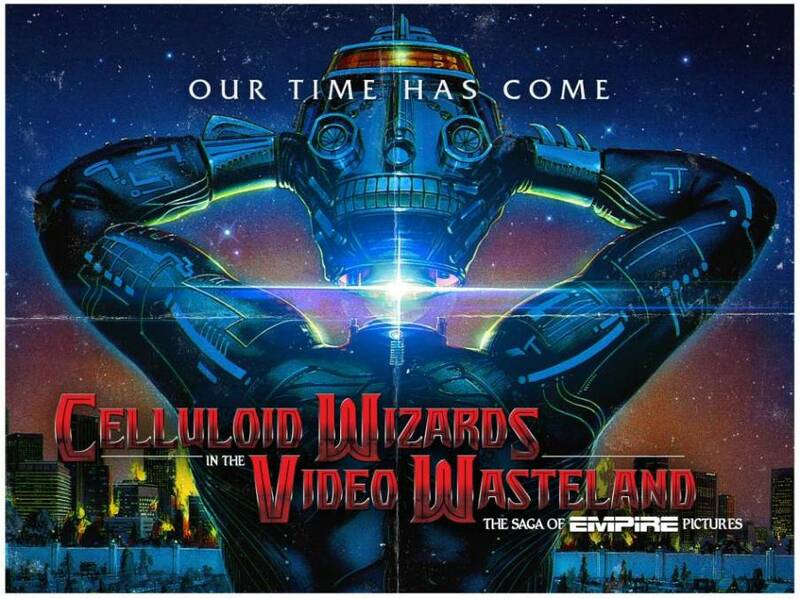 This exciting production, entitled “Celluloid Wizards in the Video Wasteland: The Saga of Empire Pictures”, follows the life of producer Charles Band (“The Puppet Master” series) leading up the creation of the most ambitious B-movie studio of the 1980’s. While other independent film companies were targeting the growing home video market, Band was producing low-budget horror and fantasy features for drive-in’s and multiplexes around the world. The early runaway box office success of films like, “Re-animator” and “Ghoulies, paved the foundation for Empire’s wildly imaginative slate of motion pictures. 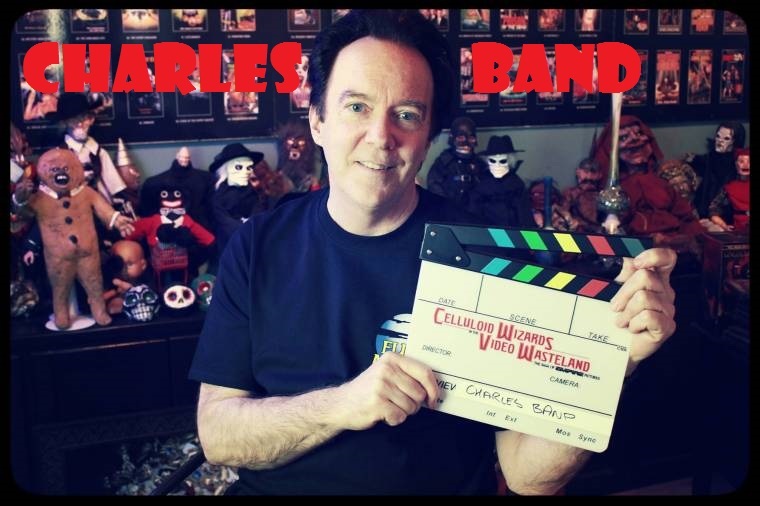 Unfortunately, Charles Band’s unbridled passion for marketing and distribution clashed with scandalous banking practices, causing his newfound company to crumble beneath him in 5 short years. But what really led the youthful mini-major to crash and burn upon the sticky floors of empty movie theaters? The thrilling saga of Empire Pictures is told through the eyes of the innovative team of filmmakers and film professionals who worked together to reinvent and reinvigorate the independent film industry in the 1980’s. Thus far, I have interviewed more than 40 individuals to tell this epic story, including director Stuart Gordon (“Re-animator”, “Robot Jox”), director/effect artist John Carl Buechler (“Troll”), editor/director Ted Nicolaou (“Terror Vision”), actress Barbara Crampton (“Re-animator”), actor Richard Moll (“Metalstorm”, “The Dungeonmaster”), and director/producer Charles Band. I have also unearthed over 500 behind the scenes photographs, as well as 20 hours of rare archival video footage. Visit the official Empire Pictures website for more details! I am inviting you to JOIN THE ADVENTURE and help bring this electrifying story to life. With this Kickstarter Campaign, I hope to raise $25,000 to cover all the final production and post-production expenses. This includes filming additional interviews, digitally transferring rare 35mm film elements and trailers, covering any legal fees, and contracting award-winning illustrator Paul Shipper to create an original theatrical one-sheet campaign for the documentary. The funds will also be used to commission an original film score by renowned Empire Pictures composer Richard Band. While the $25,000 will cover these essential elements, we hope to raise more than the initial Kickstarter goal and expand the Empire Pictures story even further. This will include fully producing live-action sequences of ‘unfilmed’ Empire projects (more information will be made available concerning this… if we meet the initial goal). When your friends, readers, or fellow film fans JOIN THE ADVENTURE, they will not only be supporting our production, they will have the opportunity to show their support to the world. In the spirit of the 80’s, I have designed exclusive merchandise for the Kickstart Campaign, including button sets, T-Shirts, and posters. Visit the Campaign for more details! Help me celebrate the history of the most daring B-movie company in the 80’s! With your support and dedication, we can break through all barriers, outwit all obstacles, and deliver a truly nostalgic documentary experience! Our time has come!